Grass&Grasses » Blog Archive » Table, or Floor? 2009/07/23 | Filed under uncategorized | Tags . 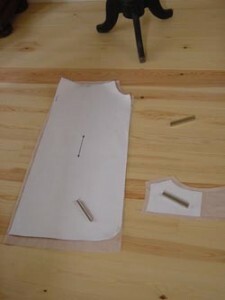 There is a topic which I have been wondering these days, it is about cutting fabric before starting to sew. That is: how overseas people are doing for that? In fact, I usually do it directly on the floor. In Japanese house, as many people know, we take our shoes off at the entrance, and keep our floor clean all the time. My own house which is in a modern Japanese style, doesn’t have any tatami in fact, but like most of Japanese people, we are definitely conservative about our basic style about taking shoes off in the house. In my childhood, my parents’ house was more traditional, typical Japanese style house floored by tatami. we have used low table to do everything such as eating,reading, studying etc, sewing off course, by sitting directly on the floor. Many things was done on the floor,too. My mother was ironing clothes on the floor, putting the flat ironing board. We spread futons (devet) on the floor at night to sleep on, and when I was boring, I often was lying on the floor and looking the wood pattern of the ceiling to find some interesting shapes. As long as I know, only Korean people have a very similar lifestyle. Korea and Japan is a kind of ‘brothers and sisters’ , so possibly this lifestyle might have been transfered into Japan in ancient time by immigrants from Korean peninsula . Thus I suppose that Korean people often cut their fabric before sewing on the floor in the same way I do now, but how about the other people? Do they have a large table always? Then I remind of a picture by Beatrix Potter in the tale of ‘the tailor of Gloucester’. In the picture, the old tailor is sewing on the board sitting cross-legged there, which seems to me neither table nor floor, or in other words, seems to me both. His sitting style is the way like many Japanese men do on the floor in casual occasion, and also at the time of Buddism meditation. I found in the dictionally, this style is called in English ‘ sit tailor fashion’ it is interesting! However, this kind of facility could be particular for professional tailors, so normally people might not have it. Then how they could do for that? and how about for seamstresses? That is my recent interest, and I am going to ask about this to my friend in Britain.